Precision – Melbourne dentist Viet Nguyen loves the precision of a job well done. This includes the challenge of complex dental work such as crowns and fillings as well as the simpler task of cleaning teeth. Preventing hospitalization – Tooth decay is the most common reason for pre-schoolers to be hospitalized in Australia and dental care is one of the major reasons for children to have general anaesthetics. Dentists can literally help prevent kids from having to go to hospital by treating tooth decay and encouraging good oral health practices from an early age. Early dental treatment can also prevent hospitalization for potentially life-threatening neck infections. Smiles and restorative care – In this article two dentists share the reasons they love their job. Sydney based dentist Dr Farrelly says he loves it most when people are no longer self-conscious about their teeth and can proudly show their smile. Dr Philippa Sawyer is a specialist paediatric dentist in Sydney and enjoys the opportunity to interact with children and provide preventative and restorative care. Relieving pain and stress – dentists are able to deal with emergencies such as a broken tooth, a lost tooth, a toothache, problems with braces, and a lost filling or crown, each of with can have a great impact on the patient! Volunteering – There are opportunities to volunteer in dentistry, which might be in Australia or overseas. The Australian Red Cross runs regular dental clinics for asylum seekers and refugees. Putting patients at ease – Dentists Dr Wilfred Koon and Dr Sonia Sonia both recognize the anxiety patients may experience during a dental consultation. Dr Koon, in an article about mindfulness, declared his passion on helping patients overcome their dental fears and anxieties while Dr Sonia mentioned that through practicing mindfulness, she was able to help her patients to be calm. Be prepared physically and mentally – The majority of dental students can expect to experience physical pain, most commonly in the neck, shoulders and back. There is also evidence that dental students experience considerable amounts of stress during their training, which is mainly due to the demanding nature of the course. Be prepared to stick to a personal wellbeing plan in order to deal with the physical and mental toll this course can take. In this article dentist Dr Rachel Hall talks about how she became burned out at the age of 29, and how she recovered. Obligations with the Dental Board of Australia – Dentistry students must register with the Dental Board of Australia and fulfill the obligations to the Board. Legal risks – although the risk of litigation is small, dentists do potentially face some legal risks when carrying out complex oral procedures. Areas of competency – The Australian Dental Council has set out six main areas of competency for becoming a dentist. These are professionalism, communication and leadership, critical thinking, health promotion, scientific & clinical knowledge and patient care. 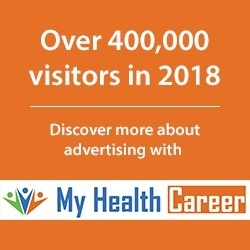 Competitive jobs market – Please expect a competitive jobs market if you would like to work in a metropolitan area upon graduation. It may take a few months to find a full time job. Are dentistry graduates getting jobs? 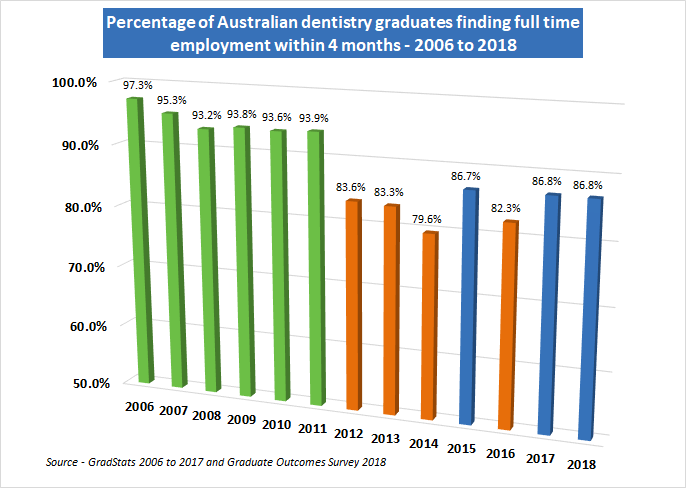 The number of dentistry graduates finding a full time job within 4 months of completing their university degree dropped by more than 10% between 2011 and 2012, and has made a significant recovery in 2017 and 2018. The 2018 Graduate Outcomes Survey – Longitudinal showed that of the 2015 dentistry graduates, 88.2% were in full time employment that year, which rose to 95.9% of this same cohort being in full time jobs 3 years later in 2018. January 2013 – Dental graduates 2012 – did they get jobs? Obviously dentists perform oral health examinations which involve a “scale and clean.” However, there is a lot more to it than that. Every day at least 3 Australians will be diagnosed with oral cancer, and dentists play an important role in making these diagnoses. Dentists also have a significant responsibility to their patients in protecting them from bloode borne diseases. Patients are at risk of diseases such as HIV and Hepatitis if dentists do not follow strict infection control protocols. By the age of 6, over half of all Australian children suffer from tooth decay. Dentists can do custom fittings of mouth guards for people who play contact sports. The Dental Board of Australia lists 13 areas of specialization for dentists, including oral pathology, orthodontics and paediatric dentistry. This article from the Australian Society of Orthodontists outlines the specialist area of orthodontics. It depends on which pathway you take, but it’s a minimum of 5 years. Please see our infographic page on the pathways to becoming a dentist for more information. Click here for ATAR information for a dentistry courses in Australia in 2018. An ATAR well above 90 was generally required. GAMSAT or UCAT – Depending on which course you are looking at applying for, you may need a GAMSAT or UCAT score for entry into dentistry. UMAT was replaced by UCAT in 2019. How much money do dentists earn? According to the 2018 Graduate Outcomes Survey the median weekly income for new graduate dentists was $1,610, which is an annual salary of $83,700. Click here to watch more videos about a career in dentistry from dentist Dr William Ha. Click here for the latest news about dentistry. Please read our scholarship listing thoroughly for this information. There is a section about dentistry towards the bottom of the page. Go to this page and click on the links to organisations such as the Australian Dental Association from there.